Judson’s Inc. was founded in 1935 and has been under same family management ever since. Service is our priority and customer loyalty our goal. We currently have over 50 employees including licensed trades workers, warehouse personnel, and office staff. Our main office and warehouses are located in Salem and we also have a branch plumbing office located in Corvallis. Serving Salem/Keizer and surrounding communities. Also serving Corvallis and surrounding communities (plumbing only). 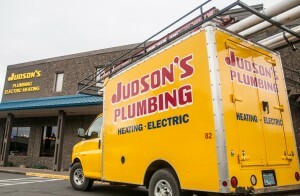 Judson’s Inc. provides full service sales, installations, and repairs of plumbing, electrical, heating, and air conditioning systems. We perform residential and commercial repair, remodeling, and new construction work in all trades. We are fully licensed, bonded, and insured (CCB# 34604). We look forward to helping you with your next problem or project! Please visit our locations page to find an office in your area.